MOSCOW (JTA) — At Russia’s largest kosher food factory, owner Pinhas Slobodnik welcomes his Muslim workers with a greeting in Arabic that he pronounces in a thick Russian accent. Some 120 workers, most from the predominantly Muslim republics of Uzbekistan and Tajikistan, are employed at the factory — a sprawling complex built in 2009 in the basement of the Chabad-Lubavitch headquarters in Russia. When it comes to kosher food for Russia’s 250,000 Jews, he hasn’t only cornered the market, he practically invented it. Slobodnik, a chef born in what is now Belarus, owns four of this capital city’s six kosher restaurants. He also operates the cafeteria at the Jewish museum in Moscow, provides kosher catering at official Jewish community events and sells some 40,000 meals each month to several large airlines, including Aeroflot and British Airways. In rooms sparkling clean enough to resemble medical facilities, workers prepare and package dishes like gefilte fish and stuffed cabbage into TV-dinner and flight-meal containers emblazoned with the logo of Pinhas Inc. — the official brand name of Slobodnik’s kosher empire. Wearing paper jackets and head covers, the workers sing along to Uzbek Muslim music blaring from boom boxes. But the music and workforce aren’t the only Muslim elements at Pinhas Inc. Earlier this year, the factory, where kashrut is supervised by one of Russia’s chief rabbis, Berel Lazar, also received the halal label — proof that the meat’s production conforms to Muslim religious laws — of the Council of Muftis of Russia. Slobodnik’s kosher-food empire has brought him not only financial success; he is also credited with helping to restore religious traditions that had been nearly erased under communism. By launching halal product lines, Slobodnik says he hopes to re-create his business achievements from the kosher world, albeit on a much larger scale. Pinhas Inc.’s factory workers, who account for approximately half of the total workforce at the company, make nine kinds of halal TV dinners. The meals hit the market in February in Russia, where 11 percent of the population is Muslim, according to a 2010 Pew study of global Muslim populations. Plans for halal airplane meals are in the works as well. “I’m bored, so I figured, ‘shoin’ [‘well’ in Yiddish], time for halal,” said Slobodnik, a stout and energetic man who often finishes sentences with “yallah” — an Israeli Arabic-language expression that translates as “let’s go.” He picked it up in Israel, where he lived in the 1990s before moving to Moscow in 2005. Since then, Slobodnik’s restaurants, all located near Lazar’s Marina Roscha synagogue, have garnered rave reviews for their unique menus. One eatery, offering Jewish Belarusian food, has four gefilte fish varieties. Another, a Georgian variant, offers a kosher version of khinkali, spicy dumplings heavy with coriander. And with the critics came non-Jewish patrons from offices nearby – including employees of the FSB, the all-powerful internal security agency that is the successor to the KGB. Its headquarters are directly opposite Marina Roscha. 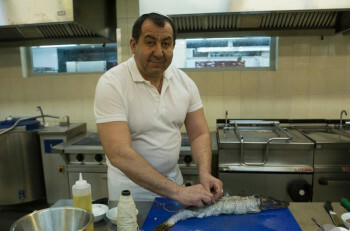 While some halal certifiers would dispute the kosher-halal equivalence, it nonetheless occurs in many communities in the Russian-speaking world, where strong secularist perceptions instilled during communist times often dictate a lenient attitude to religion. Throughout Russia, non-Jews regularly consume kosher meat in lieu of halal meat — a situation made possible because both Judaism and Islam prohibit pork and command a similar kind of slaughter: cutting a conscious animal’s neck and letting it bleed out. Judaism places additional restrictions and stipulations on how to perform this slaughter, so it’s less common for Jews to consume halal meat as as a substitute for kosher. But this, too, occurs in some former Soviet Union areas. In Azerbaijan, many observant Mountain Jews — a 2,000-year-old community originating in Persia — have switched to consuming halal from the Muslim neighbors because of the limited availability of kosher meat produced by Jewish shochets, or ritual slaughterers. From a demographic perspective, Slobodnik — a father of two who grew up in a secular household but has become more religious since moving to Moscow — says halal has the potential to move his medium-sized business into the big leagues. In Russia, some 1.3 million tons of halal meat are produced annually, making up 10 percent of the entire meat market, according to a report last year by the globalmeatnews.com news site. It’s a process that is not lost on Russian President Vladimir Putin. On Sept. 23, he attended the opening of the Moscow Cathedral Mosque, a grand building with a capacity of 10,000 that Putin said was Europe’s largest mosque. The opening is the latest sign of how Muslims from Russia’s south and center are achieving prosperity and laying down roots in Russia’s wealthier European regions. Today, Moscow is home to some 2 million Muslims, making up 16 percent of the city’s population. “Someone needs to be making the money from halal meat. Who better than Jews?” Slobodnik said. But while his halal venture is about the money, Slobodnik insists that there’s a lot of heart and history in his kosher-food business. Each Thursday at his factory, Slobodnik teaches centuries-old Jewish recipes to a group of Jewish wives. He says that many of the recipes he teaches, including local variations of blintzes and fennel-spiced chopped liver, were nearly exterminated alongside Eastern Europe’s Jews in the 20th century.